Anniversary Roses Whether it is your first, fifth or fiftieth wedding anniversary, there is a special anniversary flower arrangement to celebrate the occasion. Unless your loved one has a favorite flower, roses are typically the flower given to celebrate anniversaries. There are different anniversary roses for each year of marriage, and as our roses are hand picked from the best farms, your loved one can enjoy the roses for many days to come. 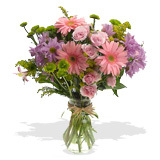 We guarantee that your special wedding anniversary flowers will arrive in pristine condition and on the date specified.